Either Mother Nature has totally forgotten about us OR she is toying with us, preparing to blow us out with winter weather. It reached 72 degrees here today and that’s warm even by southern standards. It is JANUARY for goodness’ sake! However, there is no reason to waste a weekend in my preferred temperature range, so my wreath-making friend Robin and I took off for the the Farmer’s Market yesterday afternoon. This is a wonderful regional market and in the summertime, it is packed with farmers and shoppers. Yesterday, there were only 5 or 6 vendors there, but a steady group of shoppers. I came home with some locally grown apples, some red sweet potatoes that look like fingerlings and 2 heads of cabbage collards. 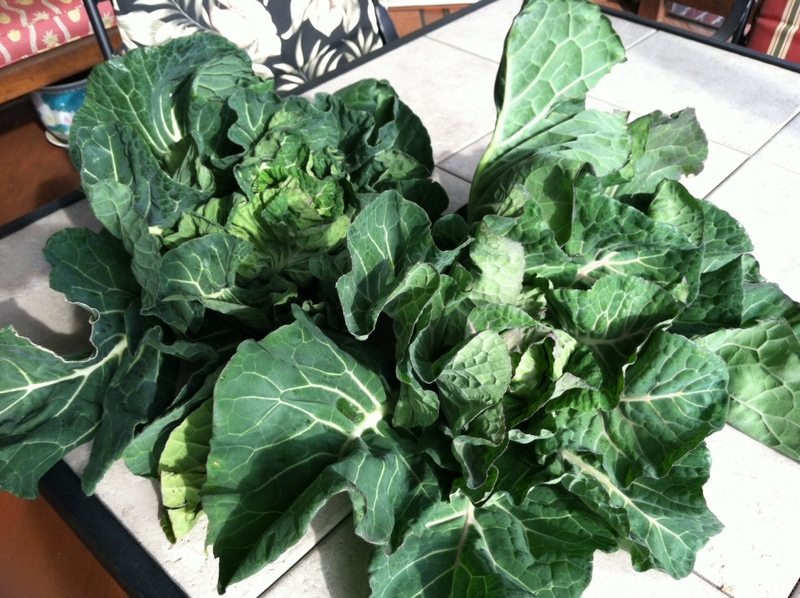 If you don’t prep and cook fresh collards, you need to know it’s a commitment! I only buy them when I’m willing to give up the couple of hours it takes to clean them, cut them and then get them in the pot for about an hour. That’s what I did this afternoon and we had them for dinner tonight with grilled steak. YUM! If you want to give them a try, I have 2 favorite recipes you could consider. The quicker to prepare one is from Emeril ; the other is from the Neely’s (Food Network). Emeril’s recipe (like how I refer to him as if we’re great friends?) calls for them to be cooked about 15 minutes or so, but I usually leave them on for 45 minutes. That gives me time to have a glass of wine before dinner’s ready. I also use balsamic vinegar instead of red wine vinegar. If you need to know you’ll have lots of flavor besides the taste of the greens, try the Neely’s recipe – Boozy Braised Greens. And if you just don’t like them, drink the bourbon and go out! If you have a favorite greens recipe, share it. I like to try new ones and my husband will eat anything. Please send Mother Nature our way if she’s tormenting your section of the world right now. Last winter’s mild weather turned into a “hot as the hinges of hell summer,” with sauna-like humidity and way too many snakes. We need some cold weather and at least one snowfall would be lovely.